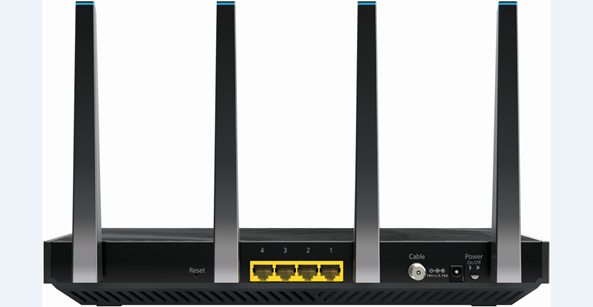 After the cable modem successfully registers on the network, the Power, Upstream, Downstream, and Internet indicators illuminate continuously to indicate that the modem is online and fully operational. For more details, refer to the Troubleshooting section. The Netgear C7500 has the following ports available on the back of the modem. at least seven seconds and the Power LED blinks white, the modem returns to its factory settings. Ethernet - Four Gigabit Ethernet RJ-45 LAN ports to connect the modem to LAN devices. Cable / coaxial - Connect the cable port to a cable wall outlet or a line splitter. Power - Press the Power On / Off button to provide power to the modem. The lights indicate the current status of your modem. To troubleshoot any connection problems, use the table below. Off No power. No power is supplied to the modem router. White None. Power is supplied to the modem router. The cable modem is too warm and might overheat. A red power light indicates thermal cutoff mode. Wait a couple of minutes to let the cable modem cool down. Make sure that the cable modem is placed in a vertical position. Make sure that the cable modem is placed in a location with good ventilation. Blinking White Scanning for downstream channel. Verify all cable connections and try resetting the modem. Solid Amber None. Connection established on one downstream channel. Solid White None. Operating on more than one downstream channel. Off Downstream channel inactive. Verify all cable connections and try resetting the modem. Off Upstream channel inactive. Verify all cable connections and try resetting the modem. Blinking White Scanning for upstream channel. Verify all cable connections and try resetting the modem. Solid Amber None. Connection established on one channel. Solid White None. Operating on more than one upstream channel. Off Modem offline. Verify all cable connections and try resetting the modem. Blinking White None. The modem router is synchronizing with the cable provider’s cable modem termination system (CMTS). Slow Blinking Amber or White The modem router reached the traffic meter limit. Solid White None. The modem router is online. Off 2.4 GHz radio off. Solid White None. 2.4 GHz radio on and operational. 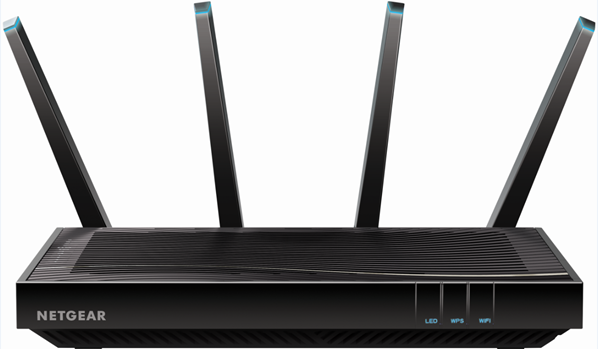 Blinking The router is sending or receiving WiFi traffic. Off 5 GHz radio off. Solid White None. 5 GHz radio on and operational.